Amul hoarding cartoon on the Sourav Ganguly and Greg Chappell spat. 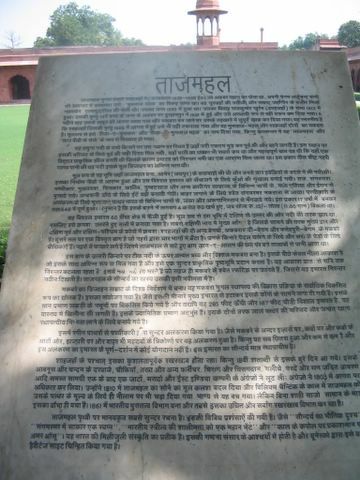 © 2005, Abhinav Agarwal (अभिनव अग्रवाल). All rights reserved. Reposted to this blog, May 2013. The Taj Mahal in Agra. 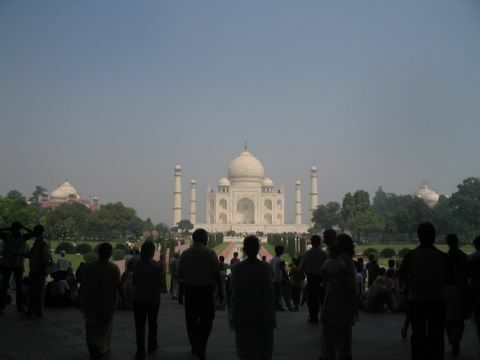 Vehicular traffic to the Taj has been stopped. You can only go on foot, or use a non-polluting vehicle. CNG (Compressed Natural Gas) vehicles are allowed. 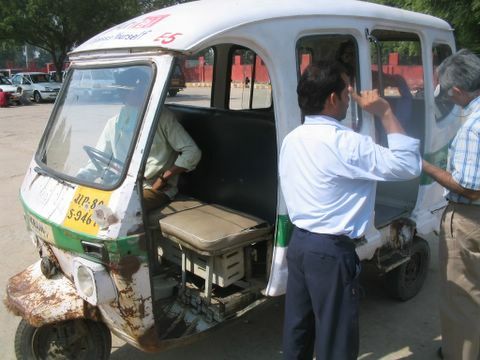 This would include buses and auto-rickshaws fitted with CNG kits. 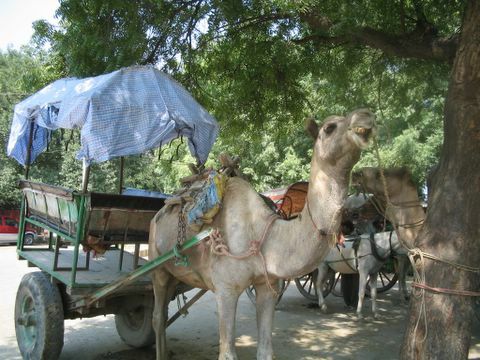 As you can see in this photo, these are mightily rickety contraptions that don't inspire much confidence. 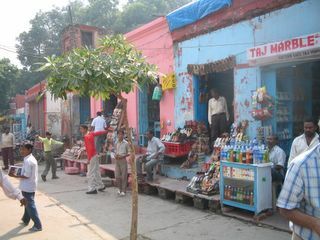 Outside the Taj complex are arrays of shops that try to sell you everything from miniature Taj Mahal replicas, cold drinks, bangles, and almost everything else under the sun. 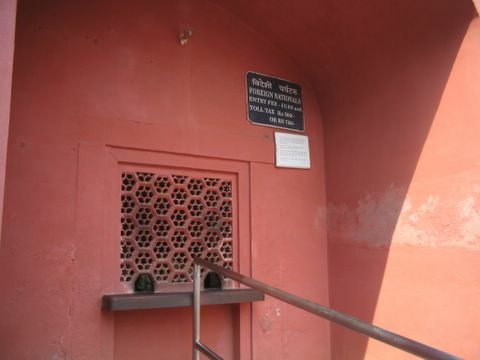 They also make it a point to remind you that eatables and beverages are no longer allowed inside the Taj complex, so it's best to quench your thirst here. The ticket counter. 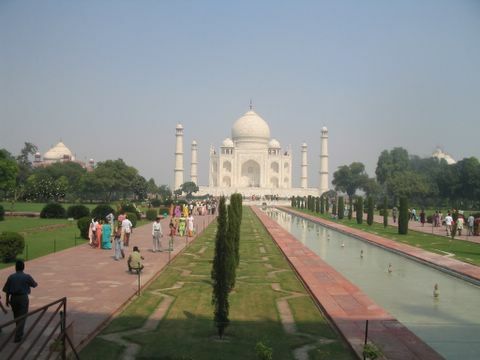 The fees is about ten rupees per person for Indians, and Rs 750. Yes, you got that right. Wonder what happened to the 'atithi devo bhava' stuff. 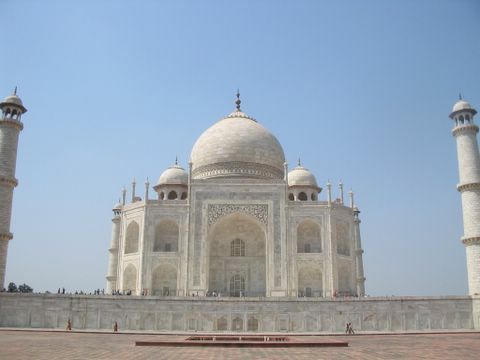 I suspect it's been replaced by 'sabse bada rupaiya'. After you purchase a ticket you have to get past the security check, where they check and frisk and run a metal detector over you to make sure you are not carring any bombs or eatables. 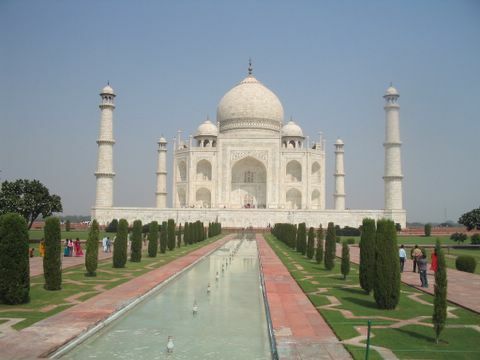 Yes, both are considered unacceptable inside the Taj. 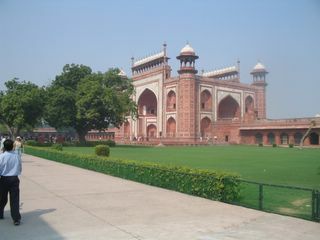 This is the south gate to the Taj (or maybe it's the west gate, I am not sure). 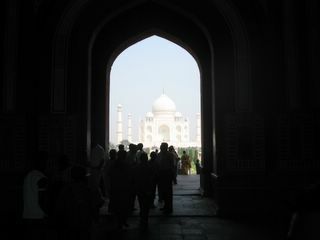 As you approach this gate, you start to get the first glimpse of the Taj. 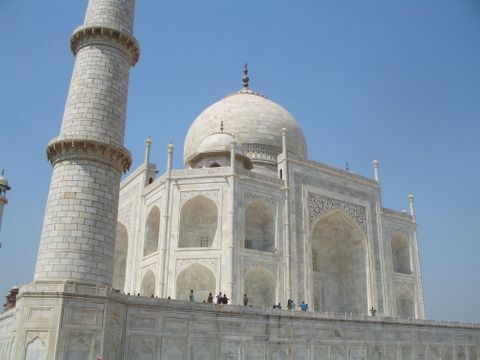 It's dome and a couple of minarets become visible. As you walk through the gate, you get your first full view of the Taj. Impressive, to say the least. So this is how the Taj looks like from the entrance. At the left and right are mosques. Ok, so if you get closer to the Taj, it still looks as white and beautiful and, uh, crowded. Even on a sweltering day with the mercury topping 35C there are hundreds and hundreds of people to be seen. 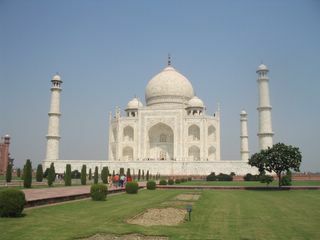 The compound is so huge, and the Taj so huge, that you can still get a shot that makes it appear that there aren't that many people around. Thank goodness for that. 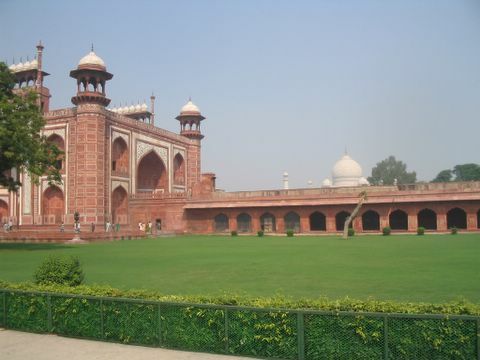 There are huge gardens on either side of the central walkway to the Taj. This is the view from the base of the Taj. If you climb up you get to the platform. These are the stairs to the platform. 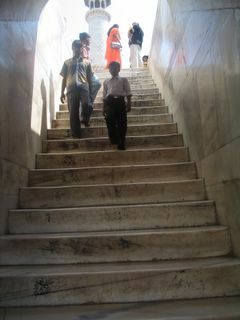 One special thing to note about these stairs is that each step is made of a single marble stone. 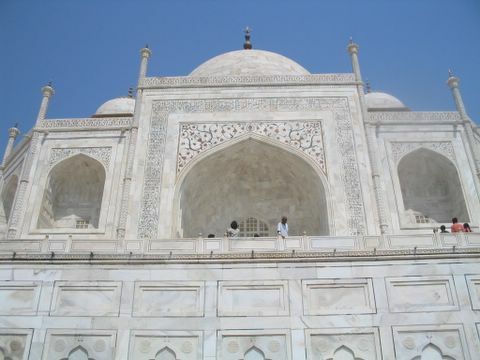 And the steps themselves are a good 10 inches high, sloping downwards slightly, which makes walking down a trickery process. 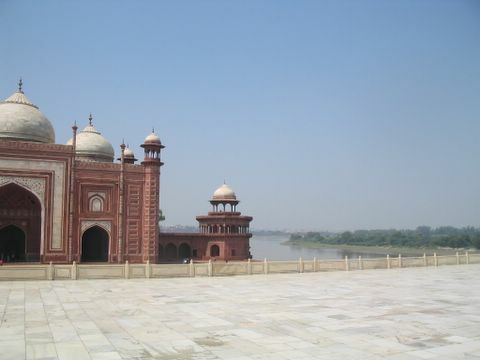 Once on the platform, if you look to the left, which I believe would be the north, you can see the Yamuna river flow. 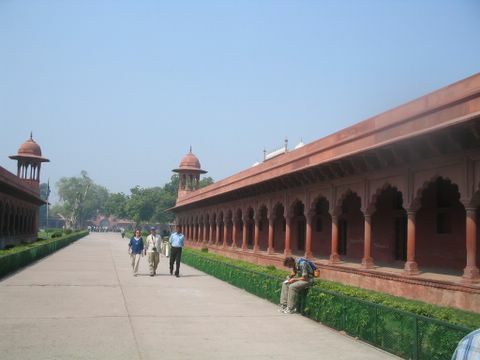 In the background, and a few kilometers away, is the Agra Fort. 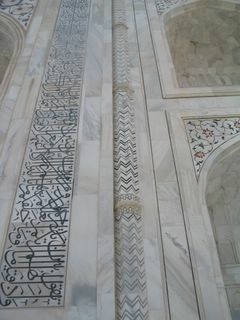 The calligraphic inscriptions are from the Kuran, and is a fine example of inlay work. Which means that there is no painting here. 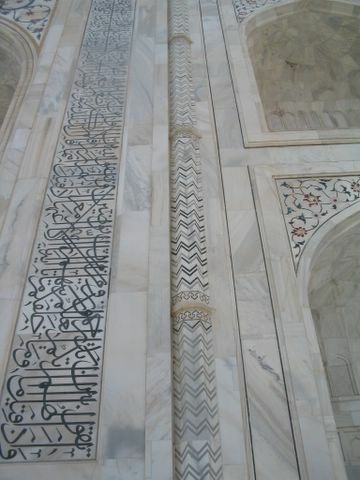 The black text has been embedded within the marble. Run your fingers over the text and you can scarcely make out the transition from marble to text. What's also special about this text is that it increases in size the higher it goes, so that the entire text looks the same size when viewed from the bottom. 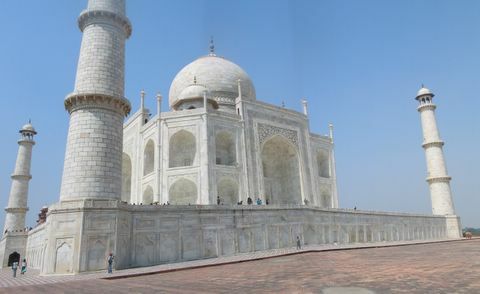 The Taj as viewed from the side of the Taj Mosque. This is the Taj Mosque, built on the western side of the Taj Mahal. 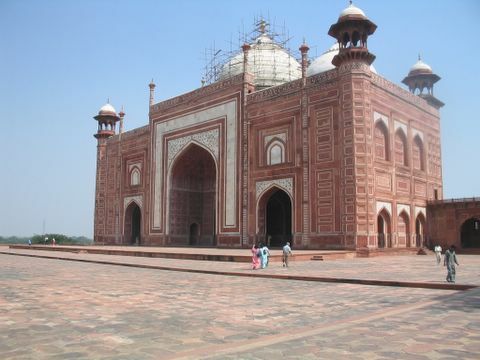 It is an exact replica of the strucure on the eastern side, called the Jama'at Khana (or Mehman Khana). This is the Taj as seen from the Taj Mosque. 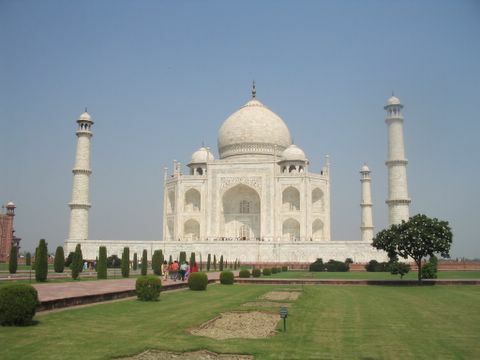 In case you haven't figured it out, the Taj is symmetrically built, which means that it looks the same no matter from which side you view it. Try it sometime. This is the plaque that describes the Taj Mosque and Jam'at Khana. 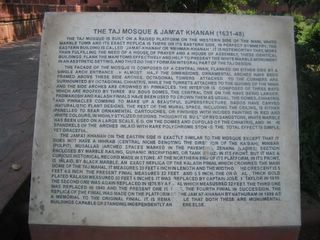 Finally, this is one of two plaques describing the Taj. 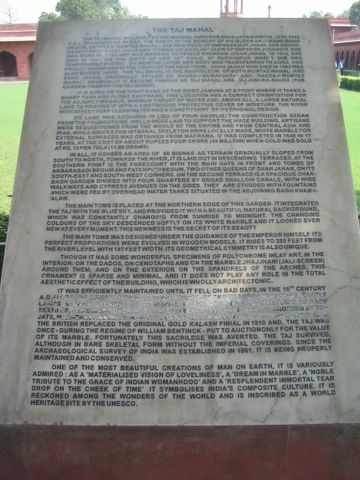 The other plaque is in English. This is the plaque in English. Ok, so if you do not like to travel the short distance to the Taj in the rickety contraption I photographed, you have the option of getting a camel ride!